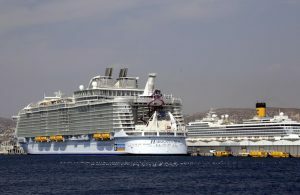 French reporters of La Provence have confirmed that an incident occurred aboard the Harmony of the Seas, the world’s largest cruise ship owned by Royal Caribbean Cruise Lines. The ship was docked in French port Marseille when a lifeboat affixed on the 5th deck suddenly detached and fell into the sea, with 5 crew members inside. The newspaper has confirmed one fatality (a 42-year-old Filipino), two critically injured, and two moderately injured. It is still unknown at this time why the lifeboat became detached or why the crew members were in the lifeboat. However some have reported that this incident may have occurred during a security drill taking place while the ship was docked.